Click Book Online above for 2019 pricing! Pricing is based on Superior Plus A Class (4-star superior plus) accommodation category. Superior T Class (3.5-star accommodation) category available upon request. Call on Madrid “Puerta de Atocha” train station to depart by train to Bilbao. Arrival to Bilbao train station and transfer to the hotel. Overnight in Bilbao. We leave on a scenic drive through the green and mountainous Basque landscape passing by Eibar. Elgoibar and Azkoitia until the Sanctuary of Loyola. Visit this monument built during the XVII and XVIII century. Continue on via Azpeitia along the Basque Coast and Zumaia until Getaria, important fishing village and birthplace of Juan Sebastián Elcano. Pass by Zarautz, surfing epicentre of the area and longest beach of Gipuzkoa. Once in San Sebastián, walking tour of the old city and port as well the Dominican Convent (XVI C.), the Basilica of Santa Maria de Coro (XVIII C.) and the Constitution Square. Accommodation. Breakfast at the hotel and departure towards Vitoria via Lasarte, Andoain, Villabona and Tolosa. A short stop at Ordizia to visit its old historical center declared Monumental-Historic ensemble. Continue to Oñati and to the most important Sanctuary of Guipúzcoa, the Sanctuary of Our Lady of Aránzazu, in charge of the Franciscan Order. Continuation to the Rioja Alavesa to arrive at Laguardia, a famous town for its historical monumental set and mainly for its cellars. Guided walking tour. In the afternoon, departure to Vitoria. Panoramic tour for its main attractions. Accommodation. Today we leave Vitoria travelling westward to the Salt Valley of Añana, where we will enjoy a guided tour of the site. We continue to Orduña, where ancient customs are still alive and follow through the Valley of Ayala to arrive in Balmaseda for a walking tour. Free time for lunch. Early afternoon departure to Bizkaia, Santurzi and Portugalete. We will cross the Vizcaya Bridge, World Heritage since 2006 towards Getxo and Bilbao area. 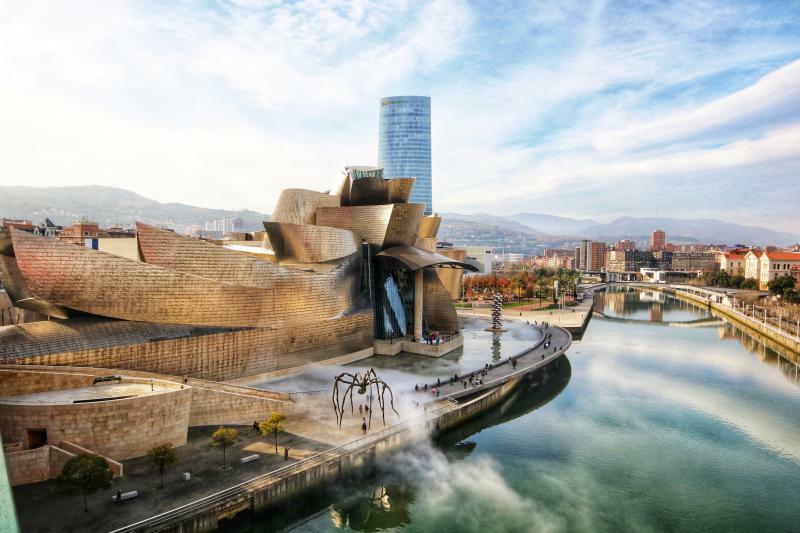 In Bilbao, we will enjoy a sightseeing tour including the Artxanda Mountain followed by a walking tour of the Old Quarter. Enjoy a self-guided tour of the Guggenheim Museum. Accommodation. Free morning until meeting time for your transfer to the train station for your departure to Madrid.